About 5 months ago I decided to go after an AWS certification. At the time I was ultimately undecided as to whether I'd attempt the Solutions Architect Associate or the SysOps exam. Ultimately, I chose the Solutions Architect Associate test. My reason being wider industry acceptance of that certification. A big reason most people seek certification is for career advancement. Earning a certification that isn't widely known doesn't help that cause. 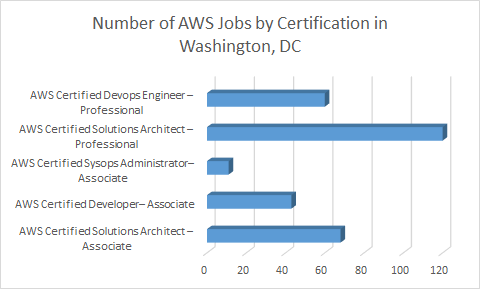 Realistically, the SysOps exam may be a better secondary credential to add on top of other more widely known AWS certifications. I searched Indeed.com and verified that the Solutions Architect Associate exam is the most sought after of the Associate level certifications. The only certification better is the Solutions Architect - Professional cert. To acquire the Pro level, the Associate level is required. The majority of my exam prep occurred during the past year of experimenting with various features while creating Proof of Concept environments for various technologies. I'm a firm believer that there's no better teacher than hands on use. In addition to the hands on work, I would watch vBrownBag videos related to the exam. The vBrownBag stuff was really great for me as I could watch it as I commuted in on the train. About a week before the exam, I attended the ARCHITECTING ON AWS 3 day course. It was a great way to bring focus on the material and get me into the right head space for testing. The week before the exam also consisted of reading the AWS Whitepapers, reading blogs, and going through material on CloudAcademy.com. Surprisingly, the AWS course was really good. I don't hear enough people discussing AWS official curriculum and how it translates. It does. You still need work beyond it, but I found it effective. I can't thank my instructor, Rich Morrow enough for his clear communication of the topics and his interactions with the students to help us contextualize the content. Branch out beyond your comfort zone by trying things with the different services. For me, that meant making simple databases using Amazon's SaaS DB services. My background is in on-premises databases, so there wasn't a lot of excitement with what I previously perceived to be limited SaaS offerings. It meant dabbling with the security services. Most IT pros have some level of specialty; with a cloud exam like this one, you have to be careful not to filter everything through that lens. During study I learned that a lot of the optins in AWS are free or so inexpensive at the scale I was at, that experimentation wasn't expensive at all. An example of this is Lambda. I'd done a Lambda demo a while back, but to be honest, it didn't make a whole lot of sense. This time was much better as I've read more about FaaS and the demo was more relatable. The particular demo tied Lambda into an alerting system which fit my predomintly ops mindset. Whenever possible, I completed hands on exercises from different training vendors. The key to working demos is understanding the purpose of the demo more than than memorizing the keystrokes. For example, if you look at publishing a website using an S3 bucket, consider all the moving parts required to make that happen as well as the security settings needed to enable it. But also important is realizing this is a different way to make a website; if you come at it from windows or Linux perspective, then you'll see how this is really different than standing up a VM and configuring a web server in either IIS or Apache. The better demos offer tons of insight into how cloud is different from traditional infrastructures. Picking up on these differences can prove useful later on.